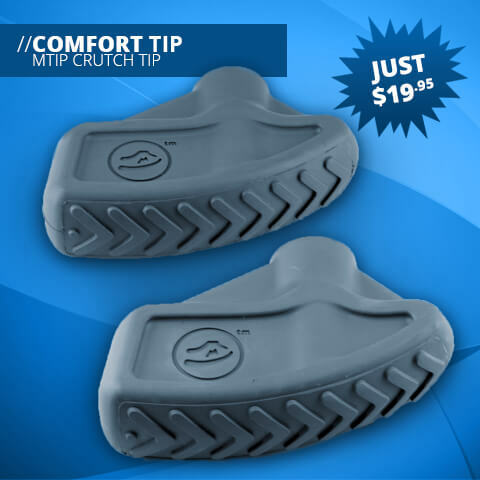 With aggressive traction and precisely engineered ergonomic shape, the MTip crutch tip increases the efficiency and stability of walking (and running) on crutches! The MTip crutch tips have been shown to reduce the peak forces during crutch strike by up to 27%, as measured using force plates while crutch walking. The MTip crutch tips asymmetric curved design also increases the amount of time the crutch is propelling a user forward by up to 23%, which translates into less effort needed to walk. This was measured using a motion capture system with force plates to identify the time spent pushing and resisting the motion. The proprietary shape of the MTip crutch tip was developed out of a gait analysis laboratory and can be used to encourage a complimentary assistive motion to increase one’s efficiency or used in the reverse orientation to increase stability and control. 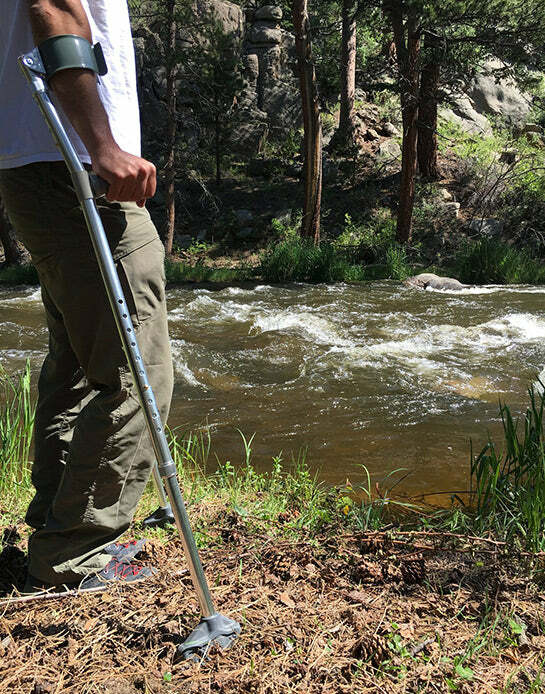 Although the MTip crutch tip is traditionally used with the treaded arrows facing forward, switching the crutch tip into its reverse orientation increases the stability and motion control at a user’s discretion—making walking down stairs and hills easier than ever! Before having these tips I always felt as though I was about to fall backward or forwards and not in control of my own speed. The "rocker tips" (I call them) add softness and smoothness to my gait thus allowing for more distance between gaits. Also (the crutch tips) make going uphill and downhill a cinch. My Pain Management Dr. Calls them my 4x4's because of the traction they have! I have been using MTips for a number of months now and have thoroughly enjoyed the experience. 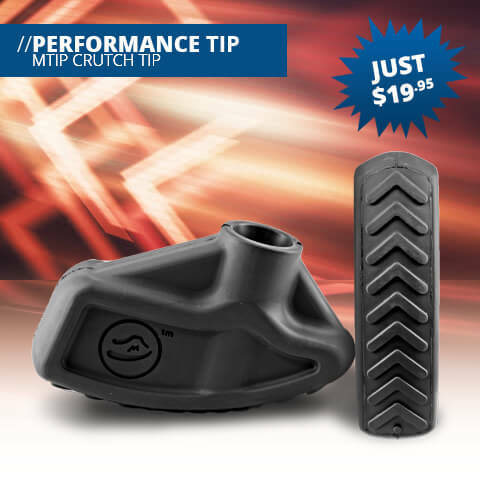 Their shape has proved useful when walking and the grip is excellent. I use my MTips across all terrain and really punish them yet the wear is minimal.